This Paleo marinara sauce recipe is one that my great grandmother from Sicily handed down to my grandmother, she handed down to my mother and then to me. My dad’s side of the family is Italian. We definitely have Italian in our blood, especially when it comes to food. Man is Italian food good or what? I think tomatoes are a staple, at least for Italian cuisine and tomatoes are so versatile. 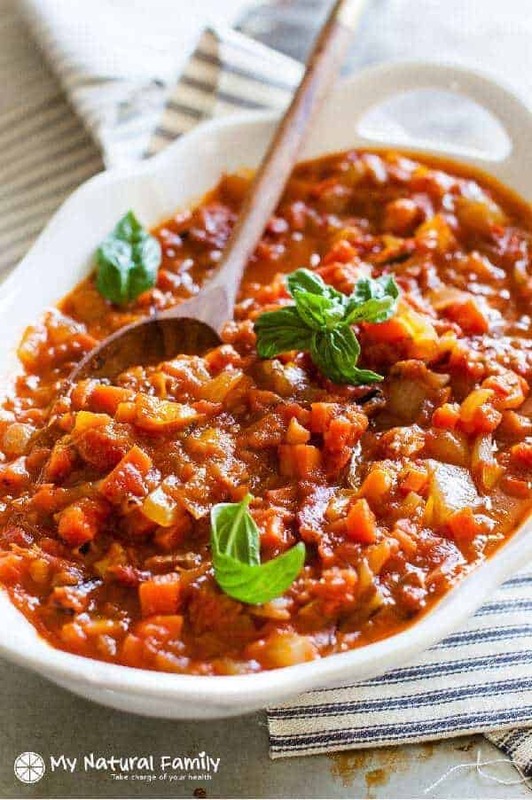 One of the best Italian dishes is a nice healthy tomato paleo marinara sauce packed full of roasted veggies! We have a delicious tomato sauce over some zoodles. 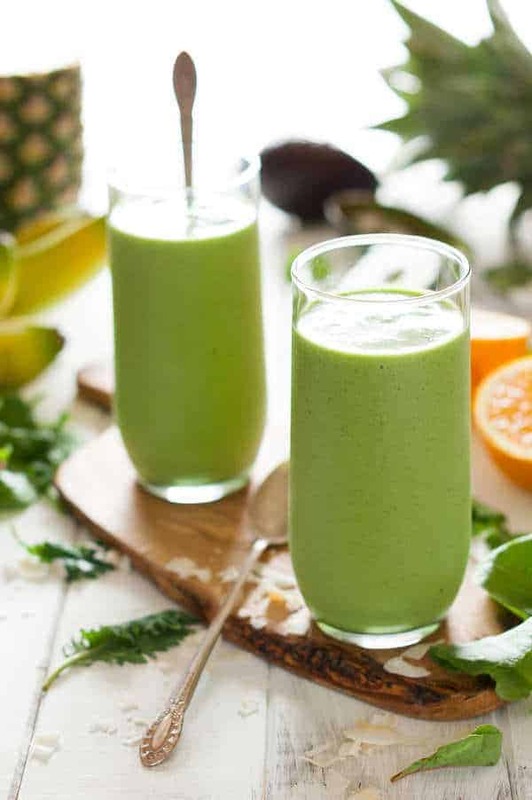 It is so good and good for you! The way we cook these tomatoes are so delicious you will never make them differently, perhaps, after trying this method just once! The roasted tomatoes give it an amazing depth of flavor and a sweetness that you can’t get any other way. I left the vegetables chunky, but small. If you want to, you can puree it all for a smoother sauce (my brother can’t stand tomato chunks but he loves it blended). It also makes a great base sauce for a bolognese if you want to add ground beef to it. I’ve also been known to use this recipe as a base for my favorite lasagna or pizza sauce. This is a perfect recipe to use summer tomatoes and other veggies from your garden or from the farmers market! Veggies are better from the store when they are in season too. I also think this would make a fantastic Paleo marinara sauce for pizza! Man, I am making myself hungry! You can put this sauce with your favorite toppings on a pizza and it will be great! Zoodles are wonderful, my mother can’t eat pasta so whenever we have spaghetti she makes zoodles instead of spaghetti and then she can eat the same thing we are. You can saute the zoodles in a little olive oil but she prefers to eat them raw. Zoodles are so much healthier and wholesome than pasta, way less fat too especially if they are raw. The sauce warms the zucchini up just enough. Zoodles are very easy to make if you use a spiralizer, which cuts them up quickly to look just like spaghetti. See below for my recommendation. What is your favorite way to use a good Paleo marinara sauce? Comment below and let us know! Who knows maybe we will use your idea for a future dish! Absolutely, all of the ingredients in this recipe are Paleo. It is much better for you than alfredo sauce or even pesto sauce. 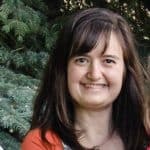 They are high in fat, sodium, and saturated fat. Marinara sauce is a healthy option with minimal fat and calories. Can you use spaghetti sauce instead of marinara? Ragu, spaghetti sauce, marinara, and red sauce are all forms of tomato sauce. They are pretty much different names for almost the same thing. See below. What is the difference between tomato sauce and marinara sauce? Marinara sauce is tomato sauce without the meat. 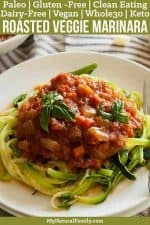 This marinara has tons of flavor from the roasted vegetables and can be easily customized, such as adding meat or using your choice of noodles. 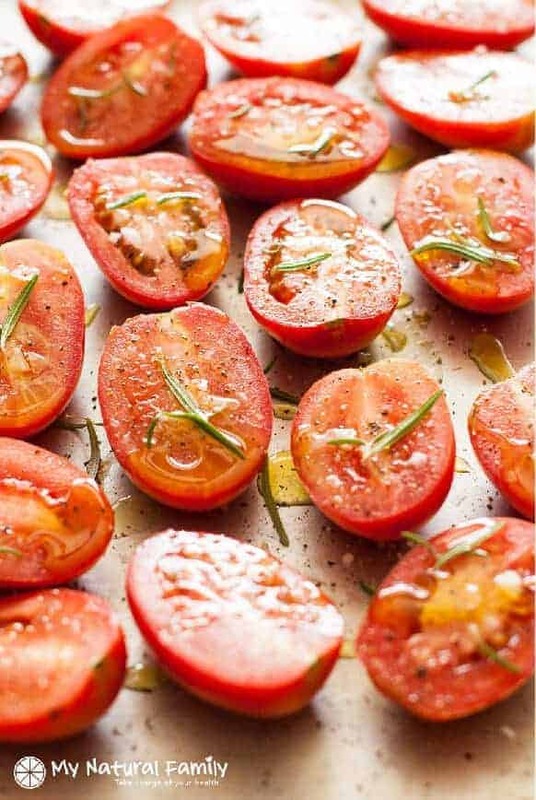 Place tomatoes cut side up on a baking sheet. sprinkle salt and pepper over the tops of the tomatoes and drizzle with a little olive oil. Roast in the preheated oven for 2 hours, until they are soft, fragrant, and browned on top. Place tomato halves, oil, and juices in a blender and pulse until roughly pureed. Set aside. Heat 2 tablespoons of olive oil in a large frying pan on medium/high heat. Add the onion, peppers, and carrots and saute for 4-5 minutes, or until the onion is translucent. Add the salt, rosemary, oregano, and chili flakes to the pan and saute for another 3-4 minutes. The vegetables should start lightly caramelizing. Add the garlic and saute for an additional 30 seconds. Add the water, bay leaves, and the roasted tomato sauce to the pan and reduce the heat to medium. Remove the bay leaves and adjust seasonings, adding more salt if desired. This is a wonderful homemade marinara sauce. I love it on zoodles. I like them raw, the sauce is hot enough to warm them up and cook them a bit. This sauce was delicious. I’m working on limiting my animal products and I didn’t even miss the cheese with this flavorful chunky marinara! Yum! I’m so glad you like like! I love it too and I love that my children eat all sorts of veggies when I make this.